A few weeks ago I posted a birder’s challenge question where I asked you to tell me how the Riverside Wren (Thryothorus semibadius) was positioned in its nest (go to the archived story here). Here is the recap and your responses. Since Riverside Wrens are known at times for roosting inside their nests during all seasons of the year with sometimes two or three individuals at a time we wondered about this particular wren when our neighbors Jim Tamarack and Cheryl Chip showed us this photo. It was taken at night during the month of December. Its position wasn’t immediately obvious so I thought I would pose the question to you. What is this bird doing and how is it positioned in the nest? Everyone agreed that the black-and-white striped feathers are the breast feathers and that the rufous part at the top is the head facing back and to the side while keeping an eye on, well…Jim and Cheryl’s camera for starters. It was also the general consensus that, due to the photo session taking place, this posture was a likely a defensive one as well as a protective camouflage while in the vulnerable place it was in inside the nest. One person commented that they could actually see the feet perching on the branch and that the bird is standing up (sort of) with its belly facing the door. If you zoom in you can see the feet. On a lighter note someone suggested that it was either a defensive posture or the bird practicing some yoga. For many people who visit the Osa Peninsula on vacation this wouldn’t be out of the question, but Riverside Wrens…? I think that everybody had it right but it also begs the question; how many species build roosting nests or use old breeding nests to roost in later? It is not uncommon for cavity nesting birds to also roost in the cavity during the non-breeding part of the year. For birds that build covered nests here in the tropics it could actually be a good way to shelter from the often times torrential downpours we have here in the winter rainy season. It is an interesting question and one to look into a bit further. Keep an eye out next week for a little bit about the Turquoise Cotinga. For those of you who may remember, I posted a feature on the Riverside Wren (Thryothorus semibadius) back in April. It was one of my first postings for the then new Friends of the Osa’s blog The Osa Chronicles and a few of you commented on both the nature history and photography by Gianfranco Gomez. 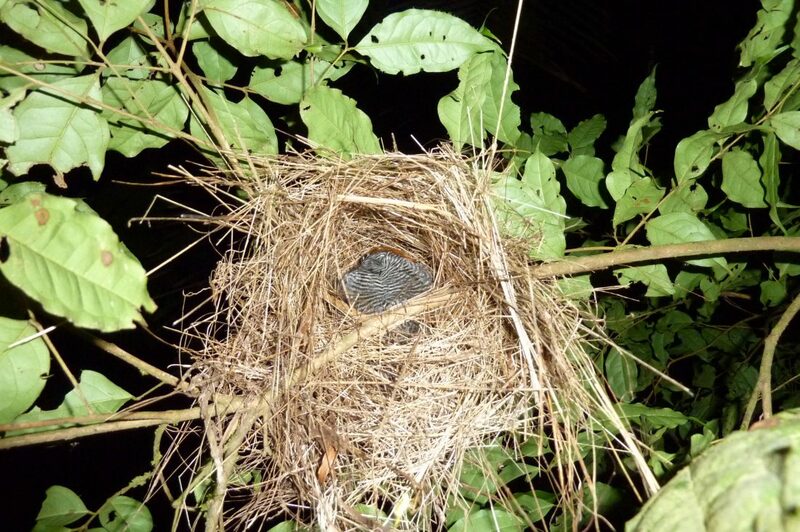 Not long after this posting some friends and residents of the Osa Peninsula Jim Tamarack & Cheryl Chip saw the posting and sent me this photo they took of a Riverside Wren roosting in its nest at night near their home. This photograph was taken in the month of December, but it also could have been taken any time of the year. Now, the position of this bird has had many of us puzzled for some time so I am inviting commentary from you all. It looks like the bird is camouflaging itself in the nest, but how? The Riverside Wren has barred black-and-white stripes only on the breast and belly while the back is solid rufous. It’s as if it were laying on its back. Are there two birds here? Is this the Riverside Wren? OK birders, its time to chime in. I am waiting for your opinions and comments. 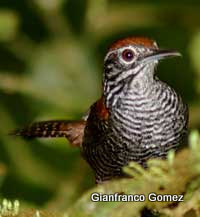 Of the 22 species of wrens found in Costa Rica, 6 are found here on the Osa Peninsula. The Riverside wren, a common resident on the Osa, is only found in the southern pacific lowlands of Costa Rica and western Panama up to ~1,200 m. Wrens as a whole belong to an interesting family of songbirds. The sexes are alike and the tropical species often remain with their mate throughout the year. They roam amongst the dense vegetation singing duets with each other in alternating phrases and one can often hear scolding notes or tell-tale wren churrs. They can be found along streams or the edges of swampy openings in the forest, but with the arrival of the rains and sometimes seasonal flooding they will move to dense forest thickets or brushy areas away from water. Nests are bulky globe structures with a roof and a vestibule (so to speak) not only used for raising young but also for sleeping at night any time of the year by either one individual or as many as possibly 3. This species can be found nesting from December to August, nine months out of the year! We would like to thank Gianfranco Gomez from the Drake Bay Rainforest Chalet http://www.drakebayholiday.com or http://www.thenighttour.com for their stunning photographs and allowing us to showcase them. You can find them just up the coast from us in Drake Bay, Costa Rica. We also want to thank the Osa Recording Project headed by Jeff Woodman which enables us to bring you these sounds. We will keep you posted on the progress of this tremendous undertaking and when our CD will be available.